BACKGROUND AND PURPOSE: Refracture after percutaneous vertebroplasty in patients receiving oral glucocorticoid therapy has caused some patients and referring physicians to have negative perceptions concerning the efficacy of the initial vertebroplasty treatment. The purpose of this study was to analyze symptomatic refractures after vertebroplasty in patients on oral steroid therapy. We hypothesized that the higher refracture rate of patients on oral glucocorticoid therapy after percutaneous vertebroplasty is due not to an inadequacy of the procedure but rather to a naturally higher predisposition of these patients to refracture compared with patients with primary osteoporosis. METHODS: A retrospective analysis was performed on all osteoporosis patients having initial vertebroplasty from August 1999 to August 2003. The follow-up period was limited to 1 year after initial vertebroplasty session, with the last follow-up date ending in August 2004. Data were collected on 387 osteoporosis patients. RESULTS: Of the patients with primary osteoporosis, 20.6% patients refractured whereas 37.8% of the patients with steroid-induced osteoporosis had symptomatic refractures within 1 year of initial vertebroplasty. Relative risk of refracture within 1 year for the patients with steroid-induced osteoporosis was 1.84 compared with the patients with primary osteoporosis. In addition, the patients with steroid-induced osteoporosis were more likely to refracture after their second treatment session (within 1 year of initial vertebroplasty) than those with primary osteoporosis. CONCLUSION: Patients presenting on oral steroid therapy at their initial vertebroplasty are almost twice more likely to have symptomatic refractures than primary osteoporosis patients within 1 year of initial vertebroplasty. Percutaneous vertebroplasty is a relatively new procedure to treat painful vertebral compression fractures.1–6 Many patients undergoing vertebroplasty have fractures secondary to osteoporosis. In particular, patients with secondary osteoporosis from oral steroid therapy may present with vertebral fractures amenable to percutaneous vertebroplasty. Epidemiologic studies have found that patients on glucocorticoid therapy have had a doubling in the risk factor of hip fractures.7–10 In patients with chronic obstructive pulmonary disease (COPD), oral steroid users are twice as likely to have vertebral fractures compared with those who do not use steroids.11 Loss of trabecular bone has been thought to be the predominant cause of pathologic fractures in oral steroid-induced osteoporosis.12–14 The purpose of this study was to analyze symptomatic vertebral refracture rates after vertebroplasty in patients with oral steroid-induced osteoporosis. It was our hypothesis that the higher rate of refracture of patients on oral glucocorticoid therapy after percutaneous vertebroplasty compared with patients with primary osteoporosis was a result of the group of patients using steroids having a naturally higher predisposition to refracture, which is independent of the vertebroplasty. A retrospective analysis of all patients with the diagnosis of primary osteoporosis or secondary osteoporosis as a result of oral corticosteroid use who had initial vertebroplasties was performed from August 1999 to August 2003. A total of 350 patients with primary osteoporosis and 37 with steroid-induced osteoporosis fit these criteria. The average age was 76.7 years old. All patients with pathologic vertebral fractures secondary to breast cancer, lung cancer, multiple myeloma, or Paget disease were excluded. Patients with secondary causes of osteoporosis other than glucocorticoid use were also excluded (eg, hyperparathyroidism, nutritional deficiency). The follow-up period for each patient was cut off to 1 year after initial vertebroplasty session, with the last follow-up date ending in August 2004. All patients were considered for steroid-induced osteoporosis if they presented on oral steroid therapy at the first vertebroplasty session. Patients who may have been on intermittent oral therapy in the past, but not at the time of the first vertebroplasty, were not considered part of the steroid group. The etiology of oral steroid usage is summarized in Table 1. Acute/subacute fractures were defined by marrow edema on MR imaging (1.5T unit using spin-echo T1-weighted, T2-weighted, and short τ-inversion recovery sequences) or evidence of fracture on CT/plain films along with presence of increased uptake on technetium TC99m scintigraphy bone scan. Symptomatic patients chosen for percutaneous vertebroplasty had no neurologic complications and had intractable pain, failed a trial of conservative therapy, or had decreased activities of daily living. Typical cases involved elderly women with a short history of back pain after falling or performing a normal activity of daily living. The back pain was usually described as 10 of 10 and was associated with significant decrease in mobility and quality of life. After ordering plain films to detect vertebral fracture, the primary care physician referred the patient to the radiology clinic. Our interventional radiologists, focusing on spinal point tenderness and neurologic function, performed a thorough history and physical. Further imaging usually involved MR images to detect the presence of acute fracture and whether retropulsion was present. After vertebroplasty, patients usually experienced significant pain relief within the first 2 weeks. If back pain recurred, the patient was asked to return to the radiology clinic for further evaluation. Our group of 3 interventional radiologists performed the vertebroplasty procedures using the same technique. The anesthesiology department provided sedation, pain control, and prophylactic antibiotics. Bupivacaine was used to anesthetize the skin and soft tissues to and including the periosteum over each fractured vertebra. An 11 or 13 gauge trocar was then advanced through the pedicle under biplanar fluoroscopy guidance into the anteriormost portion of the vertebral body. Codman Cranioplastic polymethylmethacrylate (Depuy CMW, Blackpool, UK) mixed with sterile barium sulfate (Bryant Corporation, Woburn, Mass) and vancomycin was delivered using the EZflow Cement Delivery System (Parallax Medical, Sunnyvale, Calif) from 1999 to mid-2002. From mid-2002 to August 2004, Simplex-P polymethylmethacrylate, sterile barium sulfate, and vancomycin were injected using the Percutaneous Cement Delivery System (Stryker-Howmedica Osteonics, Kalamazoo, Mich). Bone cement was injected into the central anterior intravertebral space until adequate filling was achieved without extravasation. If cross-filling was inadequate, a bipedicular approach was then performed. If any paraspinal or intradisk leakage of cement occurred, injection was temporarily halted to allow hardening of cement and then reattempted. If any epidural extravasation occurred, the injection phase was then terminated. All patients were observed in the recovery room for 2 hours and then discharged to their previous disposition. Follow-up phone calls were made at 1–2 days, 1 week, 2 weeks, 1 month, 3 months, and 6 months. After 6 months, all patients were asked to contact the radiology clinic if new pain occurred. For those patients with recurrent pain, follow-up was extended to 1 year or more. All follow-up imaging ordered by primary care physicians for subsequent pain after initial procedure was performed at our community hospital. 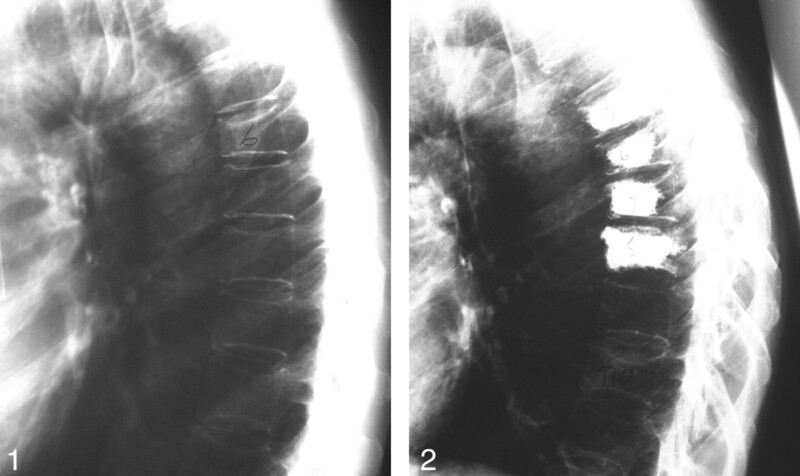 A typical patient’s radiographs are shown in Figs 1 and 2. Many patients experienced new fractures after 1 year and were followed up during this time. Because of our cutoff period in this study, these new fractures were excluded. New symptomatic fractures were assessed by spinal point tenderness and radiologic evaluation, including plain films, MR, CT, or bone scan. Subjects were divided into 2 groups depending on the nature of the osteoporosis (primary or steroid-induced). Locations of the fractures were divided into 3 regions: T3–T11, T12–L1, and L2–L5. Prevalent fractures were summarized by region and for the whole spine (T3–L5) as the occurrence of a prevalent fracture in the given region. Incident fractures were summarized in 2 ways for each subject by region and for the whole spine: (1) the occurrence of an incident fracture in the given region and (2) the number of incident fractures in the given region. For the steroid-induced patients, the measure of steroid dosage was given in milligram-months. Age (in years at the beginning of the study period) was also used as a covariate in some of the analyses. This study explored the differences between the 2 groups of patients in terms of (1) occurrence of any incident fracture within 1 year of a prevalent fracture, and (2) the number of incident fractures that developed within 1 year of a prevalent fracture. The association between prevalent and incident fractures was modeled using multiple logistic regression analysis. Results are expressed as odds ratios and relative risk. For those in the steroid-induced osteoporosis group, a logistic regression was performed to determine whether dosage had a significant effect on refracture. A t test was performed to determine whether the number of refractures in any location were different between the 2 osteoporosis groups. Finally, a series of 3 t tests (using a sequential Bonferroni correction to avoid inflation of the type I error) were performed to determine whether the number of refractures in each of the 3 spine regions between the 2 groups were different. All tests of hypotheses were performed using a level of significance of α = 0.05; where appropriate, steps were taken to avoid inflation of the type I error that occurs when doing multiple testing. All analyses were completed using SAS (SAS Institute, Cary, NC). Patients were divided into 2 groups, based on whether the osteoporosis was primary (n = 350) or steroid-induced (n = 37). The initial analysis ignored location of refracture and answered the question: how do the location of the prevalent fracture and the form of osteoporosis affect the occurrence of an incident fracture anywhere in T3–L5 within 1 year of the initial fracture? After adjusting for age, it was found that the location of the prevalent fracture did not affect the occurrence of an incident fracture. 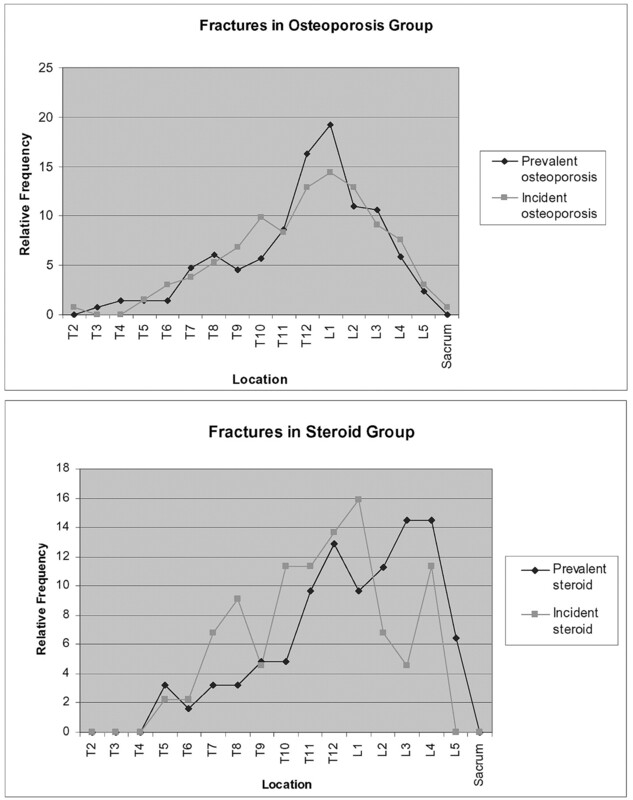 However, the patients who were in the steroid-induced group were more likely to have an incident fracture. The odds ratio (OR) for patients with steroid-induced osteoporosis developing a fracture anywhere was 2.4 (95% confidence interval [CI] = 1.14–4.90). That is, the odds of having an incident fracture were 2.4 times higher for the steroid-induced group than for the primary group. A confirmatory χ2 analysis yielded the relative risk (RR) = 1.84 (95% CI = 1.16–2.92), indicating that the risk of refracture for the steroid-induced group is nearly twice the risk for the primary group. Follow-up analyses were similar, but outcomes were restricted to specific regions of the spine. For 2 of the regions (T3–T11 and T12–L1), patients in the steroid-induced groups were more likely to develop an incident fracture than were patients in the primary group. Patients in the steroid induced group had an OR = 3.7 (95% CI = 1.56–8.59) for developing an incident fracture in the T3–T11 location. Patients in the steroid-induced group had an OR = 3.0 (95% CI = 1.24–7.05) of developing an incident fracture in the T12–L1 location. The OR was not significantly different from that in the L2–L5 location. A Bonferroni correction was used to avoid inflation of the type I error in determining significance for the results of these 3 tests. These results are shown in Table 2. It was also hypothesized that the dosage of the steroids taken by the steroid-induced group might have an affect on the development of incident fractures. The total dosage taken by these patients was calculated in milligram-months (mg-m). This was modeled using logistic regression, where the outcome was the occurrence of an incident fracture with mg-m as the predictor. The mean dosage for those in the steroid-induced group who had refractured was 496.39 mg-m and for those who had not refractured was 344.14 mg-m. Although the refracture group had a larger mean dosage, milligram-months was not a significant predictor of refracture (P = .3593). After exploring the occurrence of incident fractures, this study also sought to answer the question: Is a steroid-induced osteoporosis patient likely to develop more incident fractures than a primary osteoporosis patient? The results of a Wilcoxon Rank Sum test indicate that the median number of incident fractures in any location for patients in the steroid induced group was larger than for the primary group (P = .0025). Subsequent tests explored the same question for each of the spinal regions T3–T11, T12–L1, and L2–L5. Steroid-induced osteoporosis patients developed more incident fractures than primary osteoporosis patients in the T3–T11 region (P = .0009) and in the T12–L1 region (P = .0025). There was no significant difference in the L2–L5 region (P = .2081). The results, including mean numbers of incident fractures are shown in Table 3. Because the median number of incident fractures was equal to zero for both groups in all locations, the means were reported instead. Refracture after percutaneous vertebroplasty results in decreased quality of life. In addition, some patients and referring physicians develop negative perceptions concerning of the efficacy of the initial vertebroplasty procedure. Hence, it is important to identify patients who are at increased risk of refracturing so that physicians can offer them a realistic expectation of the long-term success of the initial vertebroplasty. Identification of the root causes of subsequent fractures after vertebroplasty has been studied and reported in the literature. In particular, levels of activity after procedure, disk extravasation, and degree of osteoporosis have been identified as possible factors contributing to subsequent refractures.15 Of these factors, we believe that the degree of osteoporosis is the main contribution. In this study, we analyze refracture rates among patients with osteoporosis who were receiving oral corticosteroid therapy during initial procedure. Our 1-year follow-up data population of 387 patients consisted of approximately 10% steroid-induced osteoporosis and 90% primary osteoporosis. The overall symptomatic refracture rate within 1 year was 22.2%. This refracture rate is similar to that in our previous study modeling the study by Lindsay et al16 on refracture rates. In the Lindsay study, given a woman with osteoporosis with a prevalent fracture treated with conservative therapy, the refracture rate within 1 year was 19.2%. In our previous work, we found that given a woman with osteoporosis treated with vertebroplasty at 1 level, the symptomatic refracture rate within 1 year was 21.7%.17 Our previous study and the work by Lindsay et al16 did not define the number of patients with steroid-induced fractures. A cross-sectional study on older male patients with COPD analyzed steroid usage and vertebral fractures. In this study, systemic steroid users were found to be twice as likely to have at least 1 vertebral fracture and more likely to have multiple and severe vertebral fractures than patients with COPD who were receiving inhaled steroids or those not on steroid therapy.11 Our series of patients revealed that steroid patients refracture almost twice as often as patients with primary osteoporosis within 1 year of vertebroplasty. In our study, the symptomatic refracture rate for patients with steroid-induced osteoporosis within 1 year was found to be 37.8%. This is higher than the primary osteoporosis rate of 20.6%. In addition, for this sample, the patients using steroids were also more likely to have more symptomatic refractures within 1 year after the second treatment session. Table 4 reveals that 42.9% of the patients using steroids treated with a second vertebroplasty session required a third treatment session within 1 year. Only 31.9% of the patients with primary osteoporosis treated with a second session required a third vertebroplasty session within 1 year of initial vertebroplasty. 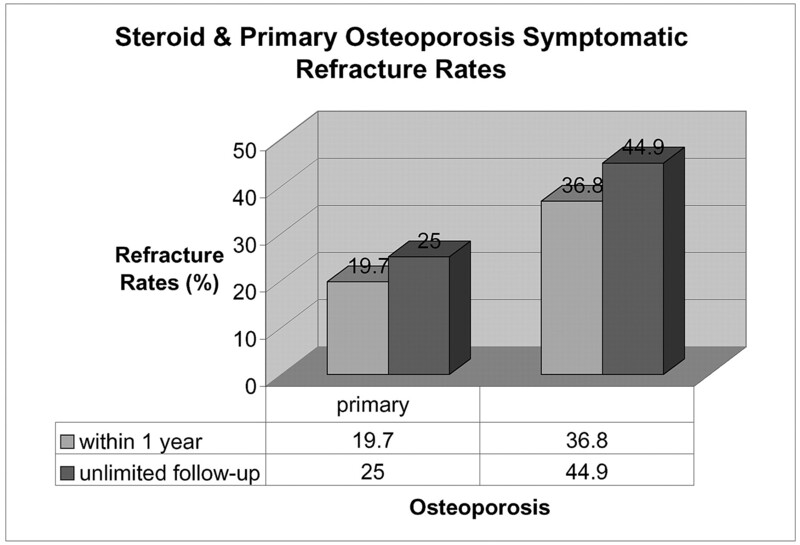 Although the difference was not statistically significant in this case, it seems that patients using steroids are likely to refracture more often than patients with primary osteoporosis within 1 year of having a vertebroplasty. A study on kyphoplasty revealed that 26 of 115 patients (22.6%) refractured after having the procedure.22 Of patients with steroid-induced osteoporosis, 48.6% treated with initial kyphoplasty refractured within their follow-up period (average, 11 months; range, 3 to 33 months). After performing an extended follow-up refracture data analysis (not limited to 1-year follow-up) for all patients with primary and steroid-induced osteoporosis who had a vertebroplasty from August 1999 to August 2004, we found that both our groups of patients had higher refracture rates than the 1-year cutoff data. Of particular interest was the fact that many of the patients with primary osteoporosis in this kyphoplasty study were refracturing after more than 1 year. Of the primary osteoporosis patients in our study, 20.9% refractured after 1 year, as opposed to the 9.09% of the steroid patients who refractured after 1 year. Figure 3 illustrates that the symptomatic refracture rates in our experience were higher for both groups of patients when the follow-up time was not limited to 1 year. A weakness in our study is that we included patients in the steroid group only if they were receiving oral therapy at the time of the initial procedure. COPD patients who may have been on intermittent steroid therapy in the past were included in the primary osteoporosis group because they did not present while receiving the medication. Hence, pure primary osteoporosis patient refracture rate within 1 year may be slightly lower than 20.6%, and the steroid refracture rate may be slightly higher than 37.8%. Overall, from Table 4, it is clear that the steroid refracture rate is higher in patients with primary osteoporosis. Another weakness of our study is that we do not have a prospective component to the study. This limitation was due to the relatively low volume of patients with steroid-induced osteoporosis who had fractures (37 patients between August 1999 and August 2003) referred to our practice compared with the numerous primary osteoporosis fractures. Because of this limitation, we do not have enough patients prospectively to make statistically significant conclusions. Analysis of the spatial distribution of incident fractures between the steroid group and the primary osteoporosis group did demonstrate higher relative incidence fractures at T3–11 and T12–L1 in the steroid group compared with the primary osteoporosis group. This was demonstrated in 2 ways: (1) in terms of the occurrence of any refracture using logistic regression analysis and (2) in terms of the number of refractures using the Wilcoxon Rank Sum test. However, there were not enough patients in the steroid group to make an analysis of the spatial relationship between prevalent and incident fractures. Table 5 and Fig 4 demonstrate the spatial distribution between prevalent and incident fractures. It was noted that standard deviations of the distribution of incident fractures did not seem to be statistically different between the steroid and primary osteoporosis group (P = .5685). This may be an artifact of the small size of the steroid group. Numerous studies have concluded that there is a relationship between glucocorticoid dosages, duration of treatment, and vertebral fracture rates. In our study, we were not able to demonstrate a statistically significant relationship, though there was a trend toward refracture associated with higher dosages. This may be related to our relatively small sample size (n = 37). The relation of oral corticosteroid use on bone mineral attenuation and vertebral fracture has been studied. One study found that age is a significant independent risk factor for vertebral fracture risk. Low bone mineral density (BMD) values were associated only with a modest increase in vertebral fracture risk when adjusting for duration of steroid use and age.23 Another study found that the cumulative prednisolone dosage effect on fracture risk was independent of its more modest impact on bone mineral attenuation.24 This study speculated that there may be a disproportionate loss of trabecular bone than cortical bone resulting in loss of strength. Hence, because BMD does not differentiate between cortical and trabecular bone, the BMDs may not adequately reflect bone strength.23 Too few BMD values were available for our patients to make any valid conjectures. Overall, oral steroid therapy in patients seems to be associated with increased risk of vertebral fracture. In particular, loss of trabecular bone may be the cause of pathologic fractures. BMD may not adequately assess the true degree of vertebral body structural instability of oral steroid patients. Polymethylmethacrylate cement is known to be 36 times stronger than vertebral cancellous bone.25 In our practice, we follow a relatively low-volume cement-filling technique. With reduced filling, less of the denser bone cement is available to crush the surrounding vertebral osteoporotic bone. The net “pillar effect” as described by Baroud25 is diminished, and there is a decreased altered spinal load. Even with relatively low-volume cement filling, we believe that patients receiving oral steroid therapy are more likely to refracture after having vertebroplasty than patients with primary osteoporosis. The symptomatic refracture rates after percutaneous vertebroplasty are higher in users of oral steroids compared with patients with primary osteoporosis. Patients on oral steroid therapy at the time of initial vertebroplasty are almost twice as likely to refracture than those patients with primary osteoporosis. In addition, patients using steroids who refracture after vertebroplasty tend to be more likely to need another procedure (the third treatment session) within 1 year of initial procedure compared with the primary osteoporosis patients. Studies have found that patients on oral steroid therapy are at higher risk for vertebral fractures.9,11 Even though the polymethylmethacrylate bone cement is much harder than osteoporotic bone, we do not believe that the procedure causes more fractures. Patients receiving oral steroids are inherently predisposed to increased vertebral body instability compared with patients with primary osteoporosis and are more likely to refracture. With steroid patients being more susceptible to further refractures after vertebroplasty, a more realistic prognosis of the success of the procedure can be provided for the patient and referring physicians. Syed MI, Patel NA, Jan S, et al. Intradiskal extravasation with low-volume cement filling in percutaneous vertebroplasty. AJNR Am J Neuroradiol 2005;26:2397–401. Accepted after revision January 23, 2006.